Pakistan have beaten New Zealand by 10 wickets on the third day of the test match at Hamilton taking lead 1-0. Pakistan bowlers were the main headlines of the day , who completely tormented the New Zealand team as they went down like a pack of cards. Abdur Rehman was adjudged man of the match for his all round performance , leading the devastation of Black Caps from the front. It was all Pakistan day, since the day they resumed batting on day three of first test match at Hamilton. Pakistani duo of Asad Shafiq and Captain Misbah-ul-Haq resumed innings from 235-4 , where both the batsman had surpassed the half century mark. After adding 21 runs into the day the first victim was Asad Shafiq , who played valiantly under the circumstances and went out for a well made 83. 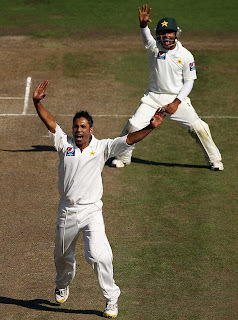 Soon was followed by Misbah , but after that there was a very important partnership between Adnan Akmal the keeper and Abdur Rehman and went on to make 76 together. Arnel and Southee were the potent of the Black Caps who provided their team with the needed breakthroughs. Soon Pakistan team were all out at 367 with a lead of 92 runs, Arnel was pick of the bowlers with 4-92. With New Zealand onto bat, they were no match for the Pakistan bowlers as Tanvir Ahmed and Abdur Rehman ripped off their backbone. Only resistance came from Mc Cullum who got caught behind off Wahab Riaz at 35. The final wickets came from Umar Gul, who pitched some beautiful bouncers to wrap things for Pakistan. New Zealand were finally bundled for just 110 , giving a mere 19 runs chase for the visitors which was cleanly done by Taufeeq Umar and Hafeez.